Provide a heightened level of security for all of your ClickUp data. Access ClickUp securely, in an instant. Sign up and log into ClickUp with your Google or Microsoft account to save you time and provide peace of mind. Customize security settings for your team. 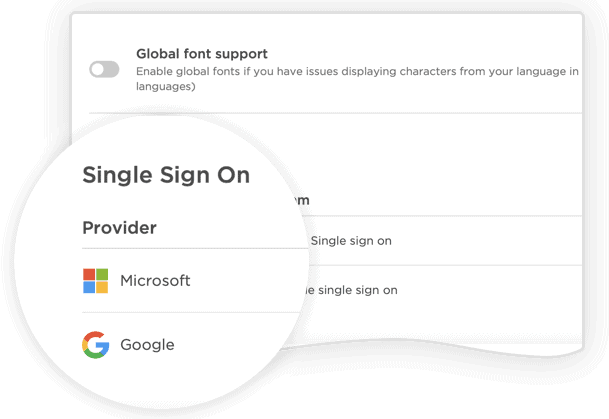 Team admins will be able to control if authentication is required, as well as if members of your G Suite or Microsoft team will be automatically invited when signing up. Your whole team can set it up fast. Monitor which teammates use SSO. Admins can easily see who on their team has linked their Google or Microsoft account to ClickUp. Be sure to check out our docs on Google & Microsoft SSO!